InFocus Capital Partners, LLC is well positioned to help high quality private and public companies Be Understood, Be Seen, and Stay InFocus. 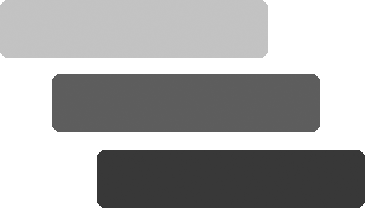 We believe visibility aids institutional investor and corporate relationships, valuations, liquidity, corporate development, new hire activity, and employee morale. If your company would benefit from increased recognition amongst high quality institutional investors and corporations contact us – we can help. President-elect Donald Trump has promised to label China a currency manipulator within his first 100 days in office. It is not our interest here to debate the merits of such a label, but we do pay attention to such discussions and make out own assessments as to the impact on our client companies. Readers are reminded that the exchange value of the Chinese yuan (also known as the renminbi or RMB) is fixed each morning by China’s central bank, the People’s Bank of China (PBoC), with a narrow band of only 2 percent allowed, up or down, within which market forces can have their say. In effect, it is an exchange rate set and controlled by the PBoC. We suspect the currency manipulation label would be applied with a view towards the RMB being artificially weak, thereby aiding China exports and discouraging China imports. Perhaps the RMB is artificially weak, but it is less weak than it was in 2014. But in fact, the RMB has been appreciat ing versus the U.S. dollar since late 2013. As the RMB has strengthened since 2013, so too has the aggregate value of deals by Chinese companies of companies outside China. As indicated, the value of such deals reached $234 bln in 2016, double that of 2015 and 4x that of 2013. A stronger RMB does make it less expensive for China companies to make acquisitions outside China. Should nature take its course and the RMB strengthen or should political pressure force up the value of the RMB, U.S. exporters very well may benefit. 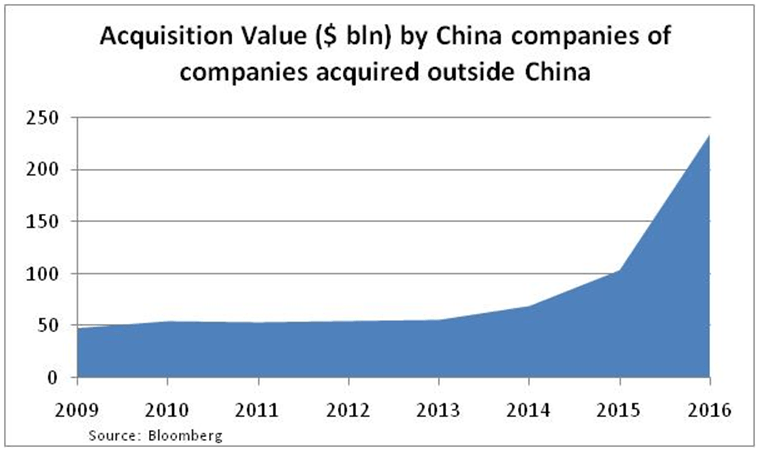 But, we would also expect a further step up in the aggregate value of acquisitions by China companies of companies outside China. And, what are China companies buying? In a Bloomberg China Deal Watch article in November 2016, Bloomberg noted every acquisition (of at least $100 mln in value each) by a China company of a company outside China since 2006. Our analysis of the Bloomberg data suggests that in 2016 there were 11 such deals of greater than $1 bln each of companies in North America (for an aggregate value of $32 bln) and 21 deals of less than or equal to $1 bln each (for an aggregate value of $9 bln). 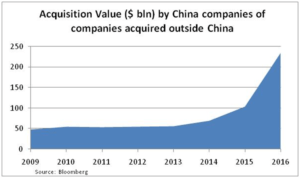 Frankly surprising to us is that China company acquisition appetite certainly includes relatively small deals. Companies, private and public, would be wise to get on corporate and investor radar screens now in anticipation of a step-up in M&A activity by Chinese companies.